Grab those dancing shoes and get ready to get grooving with this bonus sale at Gap Canada. Start prepping your wish list for this sale happening only on January 22nd, 2013 and treat yourself to a bonus 30% off your entire order, site-wide. Give some love to the Gap Canada coupon page while you’re at it. I don’t always look at the clothes for little boys but I was prompted to today since my cousin’s baby boy just turned a year old. Their entire family consists of huge boat enthusiasts and it’s being passed onto my cousin’s little boy. Hence why the port collection at Gap Canada is the ideal fit! 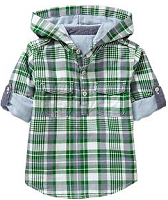 Check out this convertible popover hoodie and picture how stylish and cool your little man can be for $25.85 with the discount. I won’t deny that this pirate hoodie made me giggle. Treat your little pirate to this cute graphic hoodie for $21.85 after the discount. Offer valid online only through January 23, 2013 in Canada. Additional restrictions and exclusions apply. Click here for complete details.What are you going to snag?